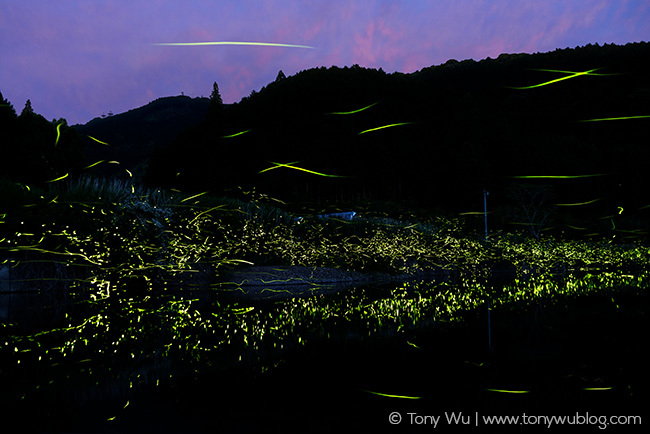 Late spring heralds the appearance of fireflies in Japan. There are many species of these Illuminated insects around the world, some 2700 according to one source I read, with over 50 types documented in Japan alone. The species pictured above is Luciola cruciata, known by the common name genjibotaru (ゲンジボタル) in Japanese, sometimes also referred to as Japanese fireflies in English (perhaps because that’s easier to say than genjibotaru). They are relatively common in many non-urban areas from May through July, the exact timing of their appearance varying with location and seasonal conditions. The “fire” produced by these bugs uses a biochemical reaction—enzyme-catalysed oxidation of a type of luciferin unique to fireflies. Entomological geek note—the presence of adenosine triphosphate and magnesium (in addition to the requisite oxygen) is necessary for emission of light (apparently not the case in other instances of bioluminescence). Also, while different species use the same luciferin compound, the colour of light varies. Moreover, each species of firefly flashes in a unique manner. This makes sense, as the insects need to communicate. From what I understand, the patterns, colour, duration, and other characteristics of light-display play an important role in the lead-up to firefly reproduction. Think of it as firefly foreplay. The photo above was my first attempt to photograph this phenomenon. Because keeping the shutter open for the length of time required to record substantial flashing would result in unacceptable levels of sensor noise, the final photo is a composite of 17 different images, taken over the course of two and a half hours or so. I have to thank my friend Kei Nomiyama for driving out to visit and telling me about the fireflies. Nomiyama-san is a researcher at Ehime University and an excellent observer and photographer of nature. The experience and photo above are special to me. Not just because the firefly display is so beautiful, but also because I really needed some light in my life, in a figurative sense. There have been many tragedies in recent months that have affected people close to me, good people I care about. I’ve done what I can, but for the most part, I’ve felt helpless, unable to do much more than watch, wait, wonder why.